Maine Maritime Academy Receives a $1.4 Million U.S. DOT Research Grant to Develop a Marine Engine Testing and Emissions Laboratory. The Marine Engine Testing and Emissions Laboratory (METEL) at Maine Maritime Academy (MMA) is working on several initiatives to implement viable emissions reduction technologies for the marine industry. Funded by a $2.8 million grant from the U.S. Department of Transportation, the METEL laboratory was developed to address environmental sustainability needs in transportation. Working with a Maine startup company, Sea Change Group LLC (SCG), the METEL team is helping to develop and implement a fuel that combines glycerin with diesel fuel to lower both operating cost and emissions for marine diesel engines. In November, MMA announced that it had been awarded another University Transportation Center (UTC) grant from the U.S. Department of Transportation for $1,414,100 to further develop the Laboratory. The DOT/UTC research grant is the largest received to date by Maine Maritime Academy and marks the first opportunity for the college to serve as lead research institution. The new laboratory will be housed in the ABS Center for Engineering, Science and Research, a state-of-the-art facility to be built in the spring of 2014 on the Maine Maritime Academy campus. According to Maine Maritime officials, METEL will concentrate efforts on a number of DOT strategic goals, including the advancement of environmentally sustainable policies and investments that reduce carbon and other harmful emissions from transportation sources. Eventually, METEL will integrate its efforts with the existing marine transportation education programs at the Academy, including marine systems engineering, marine transportation and international business and logistics. Shepherding the project forward is Dr. Richard Kimball, a Professor of Engineering at Maine Maritime Academy (MMA) and a Lecturer in Ocean Engineering at Massachusetts Institute of Technology. He has considerable experience in the area of testing marine propulsion, propellers and turbines. Additionally, he is the director of the Marine Engine Testing and Emissions Laboratory at MMA, the DOT University Transportation Center focused on the evaluation and development of practical emissions reduction systems and engine performance improvement technologies. Notably, Kimball holds a Ph.D. in Ocean Engineering from Massachusetts Institute of Technology. The fuel is called Eco-Hybrid fuel and is patented by SCG. Glycerin is a low-cost feed-stock byproduct of the biodiesel industry which contains no sulfur and reduces sulfur emissions by dilution. In addition, testing has shown approximately 25% reduction in NOx emissions and roughly 25% reduction in particulate matter emissions in marine diesel engines under at-sea conditions. This can significantly reduce the load on engine emissions systems such as Selective Calalyst Reduction systems and diesel particulate filters, which can reduce maintenance and operating costs of these devices. Beyond this, and because sulfur is not present in glycerin, it doesn’t create SOx. Glycerin is a viable low-cost fuel which reduces emissions in the same manner as water emulsions, but it can provide net power input. Glycerin also can have favorable characteristics for lubricating the injection system. The diesel/glycerin emulsion fuel is a blend. The diesel component is required so that the fuel can run as a drop-in fuel in diesel engines without engine modifications. When blended with diesel, the cost of the Eco-Hybrid fuel is expected to significantly reduce the operating fuel cost of users. Since glycerin’s heat content is lower than that of diesel, more volume of fuel is needed for a given energy output, but the cost per unit of energy is lower. The heat content of glycerin is about half that of diesel, but the cost per ton is about 1/3 of the cost of Ultra-low-sulfur diesel (USLD). Because bunker volume is critical when – for example – it impacts space or cargo carrying capacity, especially in space-limited smaller workboats, the volumetric differences are important. Due to the lower energy content per gallon, the glycerin emulsion fuel will require more volume per energy content. For a 30% mix of glycerin with diesel, this translates to about a 15% increase in fuel volume for the same energy content. To be fair, and for a given workboat mission set, that could be important. Testing at the METEL lab has shown that the Eco-Hybrid fuel has shown no measurable change in engine efficiency under typical operating conditions. METEL is currently working with Sea Change Group to validate the fuel and ensure that it maintains all benefits in a real marine environment under at-sea conditions, including performance and maintenance issues such as filtration, separators, lubricity, wear, and all things important to a mariner in a fuel. The vessel is instrumented with full fuel transfer and flow-rate capability, engine power output, and high-end marinized lab-grade emissions measurement equipment, making it a unique vessel in our industry. The testing at METEL is leading toward early adopter testing starting in spring/summer 2015. The early adopter phase will address supply chain and logistics issues as well as mariner handling protocols. With the greater goal of developing research that will address pressing needs of the marine industry pertaining to the International Convention for the Prevention of Pollution from Ships (MARPOL) emissions regulations adopted for the maritime industry, the new laboratory comes at just the right time for industry – and the Academy itself. For workboat operators, their work will be especially important. 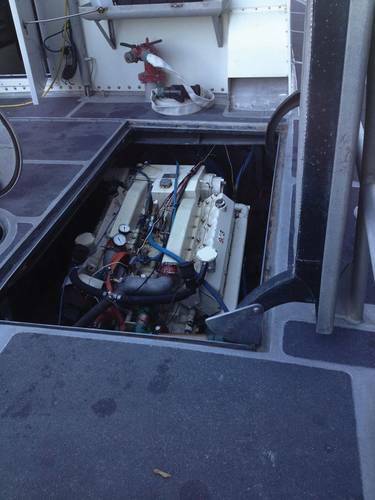 “These regulations, especially in coastal and inland waterways, are difficult to meet with existing marine engines,” said Captain Robert Peacock II, Chair of the Maine Maritime Academy Board of Trustees. That task, just maybe, got a little easier last month.